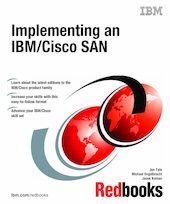 In this IBM® Redbooks® publication, which is an update and major revision of the previous version, we have consolidated as much of the critical information as possible while discussing procedures and tasks that are likely to be encountered on a daily basis. Each of the products described has much more functionality than we could cover in just one book. The IBM SAN portfolio is rich in quality products that bring a vast amount of technicality and vitality to the SAN world. Their inclusion and selection is based on a thorough understanding of the storage networking environment that positions IBM, and therefore its customers and partners, in an ideal position to take advantage by their deployment. We discuss the latest additions to the IBM/Cisco SAN family and we show how they can be implemented in an open systems environment, focusing on the Fibre Channel protocol (FCP) environment. We address some of the key concepts that they bring to the market, and in each case, we give an overview of those functions that are essential to building a robust SAN environment.